Barbecued peaches are usually served sweet as a dessert, but they work brilliantly in this lovely summery salad. The BBQ brings out the richness and depth of flavour and the residual sweetness works beautifully with the salty halloumi. Our girls love this dish. 1. To make the dressing, shake the mustard, vinegar, lemon juice and olive oil together in an old jam jar. Season to taste. 2. Barbecue the peach or nectarine slices, or place in a griddle pan. Cook for 2-3 minutes. 3. Griddle or barbecue the halloumi slices for a minute or two on each side, until golden. 4. 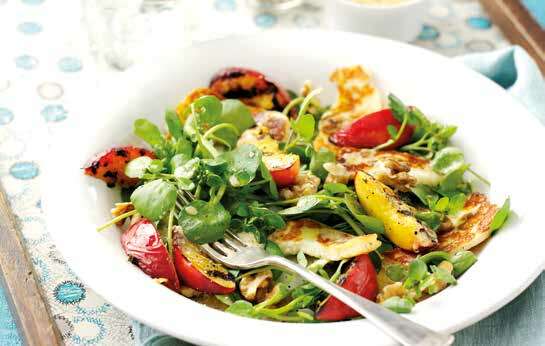 Share the watercress between 4 serving plates or bowls, arrange the peach and halloumi slices on top. 5. Sprinkle with the walnuts, and drizzle with the vinaigrette dressing. Recipe created by Lucy Bradley of Bradley’s Deli, a family run café and deli in the seaside town of Benllech on the Isle of Anglesey, one of The Telegraph’s top 25 seaside cafes in the UK.